Q: How can I filter my shopping list items according to done and undone items? A: To filter your shopping list items, simply touch the toolbar on the top of the screen (where the name of your shopping list is displayed). Here your are able to choose between the modes 'All', 'Undone' and 'Done'. The mode 'All' shows all items no matter they are checked or not checked, 'Undone' shows all items that are not already checked and hides the done items, and the 'Done' mode only gives you the checked items. Q: How can I modify existent items? A: To modify existent items within your shopping list, simply touch the edit button on the right hand top corner. Now you can press the button with the arrow to the right (next to the item) and you enter a screen where you can modify the item's properties. Touch the 'Save' button on the right hand top corner to save the changes you have made. Q: How can I add a price or notes to a product? A: To enter a price or some notes for your product, first touch the "Add new item to shopping list" button on the right hand bottom corner of your shopping list. 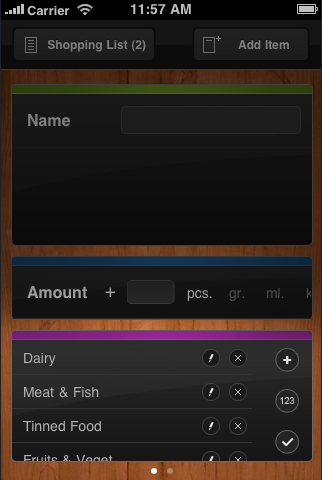 Second, swipe the bottom part of the screen (at the position where the amount and categories can be specified) and the price and notes text fields will appear. Note: To calcaulate the price per unit (e.g. 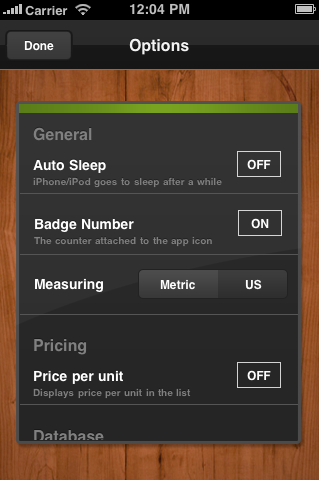 per piece), touch the corresponding label next to the price input field. Otherwise, the entered price will be taken as the total and not the entered price multiplied by the entered amount (e.g. 3x Coke $1 = $3 total vs. 3x Coke $1 = $1 total). Q: How can I turn off the badge number? To turn off the badge number, you have to go to the shopping lists overview (button 'Lists' on the left hand top corner). Then touch the options button on the left hand bottom corner to get to the options screen. At this you can turn the badge number on or off. Q: The e-mail I have sent from Shopping List seems to be empty. What can I do? A: This issue was fixed in version 1.4. Q: How can I add default lists (or recipes)? 1. 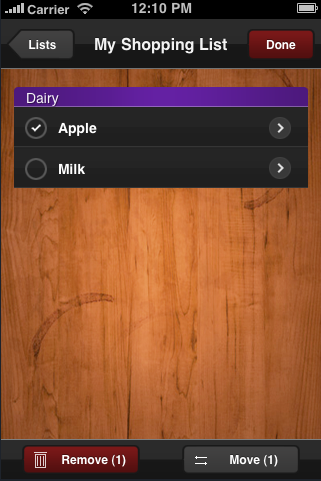 Switch to the screen where all shopping lists are displayed. 2. Click the edit button on the right hand top corner. Q: Is it possible to merge two or more default lists into one shopping list? A: This is right now not possible but will be a feature of upcoming shopping list versions. Q: How can I modify or add new categories? A: To modify or create shopping list categories, first touch the "Add new item to shopping list" button on the right hand bottom corner. Second, touch the categories label: the category section will turn around. Now you can add, remove or rename the given categories. To remove or rename a category, touch the buttons right next to the category. To add a new category press the '+' button and enter a title. A touch on the checkmark closes the view and sends you back. Q: How can I sort categories? A: To sort shopping list categories, first tap the "Add new item to shopping list" button on the right hand bottom corner. Second, tap the categories label: the category section will turn around. Now you have to tap the '123'-button - the buttons right beside the categories will change to up and down arrows. You can use these arrows to sort the categories according to the aisles of your store. Q: How do I activate online synchronization? A: 1. To activate online synchronization, tap on the middle button of the bottom menu in the screen where all your shopping lists are displayed. 2. In the next screen tap the button on the left top corner that says 'Register'. 3. 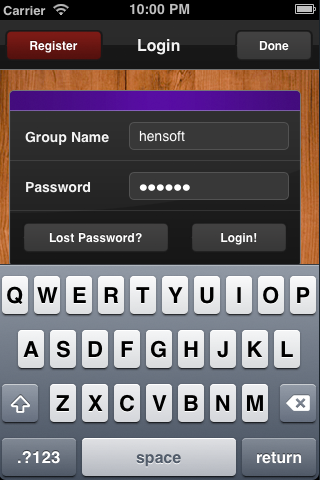 In the following screen you are able to register a group account. This group account is later on used by all the people who want to share their shopping list with you (e.g. family or friends). After tapping the 'Register' button, you'll receive an E-Mail that includes a link that let's you activate your group account. Click this link! 4. 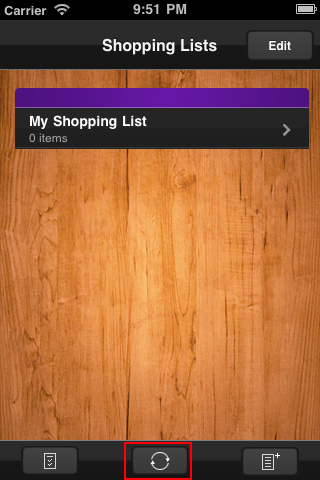 Now you are ready to login within the Shopping List app and you can begin to synchronize your shopping lists. Anyone who wants to sync their shopping list needs to login with the same group account. Q: Is it possible to maintain the shopping list with my desktop computer? 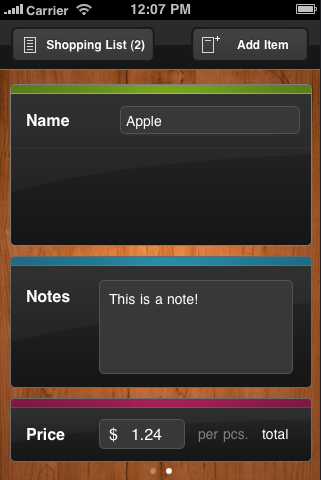 A: We are right now working on a browser implementation of Shopping List. Every user who registered a group account for Shopping List will receive an E-Mail as soon as it's done. Q: I have never received an activation mail. What can I do? A: Take a look at your spam-folder. Maybe the activation e-mail was filtered? If you still can't find it, send a mail to info@intended.de . Include your group account name and/or the registered mail-address. We will manually activate your account. A: Because the database is getting very large sometimes, we decided to not sync it with the shopping lists. 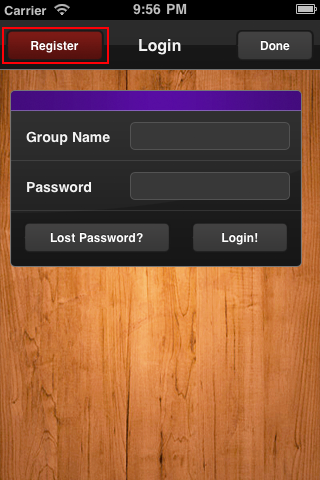 Go to the sync screen (where you also have registered your group account), to the line that says "Personal Database". Press the sync button!